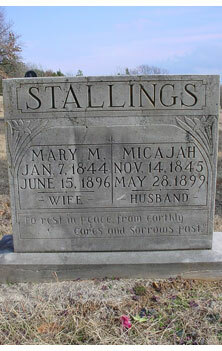 Micajah was born in 1846 and died May 28, 1899 in Greenwood, AR. He married Mary Matilda Crow, born 1844, died June 15, 1896, and had the following children: William Browning, born August 5, 1869,, died March 4, 1941; Amanda Elizabeth, born September 29, 1871, died November 1, 1893; GreenBerry, born August 19, 1873, died June 12, 1953; Dica, born October 25, 1875, died March 30, 1900; Robert Paine, born November 1, 1881, died 1964; and Lucy Matilda, born May 21, 1884, died November 13, 1953. Micajah's second wife was Cora Cantrell. Picture submitted by Linda McGahan.